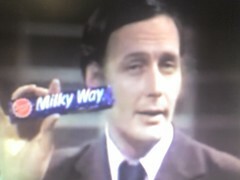 I was watching the first ever episode of That's Life the other day - I'm paid to do that kind of thing now, doncha know - and in the first item, Bob Wellings holds up one of the 'new, improved' Milky Way bars. Now, I know that the memory cheats, and that we often feel that chocolate bars were bigger when we were kids because, well, we were smaller then. But look at it. Just LOOK at it. That's the size of one of those 'double bars' (the ones they introduced after the 'King-sized' bars were accused of contributing to obesity). And the Milky Way was one of the smaller chocolate bars too. No wonder you can eat one between meals without ruining your appetite. Sneaky bastards. Urgh - people talking about their dreams. Anything more tedious? Well I'm only talking to myself here so sod anyone else looking in who doesn't find this interesting. Thursday morning, I woke up from a very detailed dream, the tail-end of which was me watching a sepia Czech animated film about a marble in the desert. It rolled up to this big hoover-tube and hopped in. The camera follows its progress from the outside until it finally plops out onto the sand at the other end. As it continues to roll away, there's this spikey piece of black fluff lurking on the top of the tube and it begins to follow the marble. The music starts playing some Sergio Leone music as the fluff is joined my a small piece of sinister lint, which joins in stalking the marble. The marble stops rolling, turns around (extreme close-up so we can see the swirl inside it turning), then quickly turns back and begins to roll at speed. The black fluff rolls faster, the lint inch-worms faster and the marble speeds up its rolling until it rolls off the edge of a cliff and shatters on the rocks below. Cut back to the fluff and the lint, which turn around and slowly roll / inch-worm away. How involved is that? I woke myself laughing. I now want to find a talented animator who can make this film... and it's only as I literally paste this into the Blog window that I realise there's a very, very obvious interpretation here about lost marbles. Damn. I love TV, unashamedly, and I'm fascinated by the illusions it creates. For instance, the huge, glitzy stages and uber-confident stars. 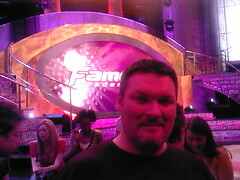 Last night, I went with a friend to see the recording of Comic Relief Does Fame Academy. We'd tried to get in on Saturday night - when Girls Aloud and Sugababes were performing live - but, understandably, it was oversubscribed, so we got priority tickets for another night. Our favourite, Mel Giedroyc, had been voted out on Sunday (travesty! ), so we'd decided to throw our support behind Tara Palmer-Tomkinson, whose fragile, delicate performance has won over so many people. She's a bit sharp and tuneless at times, but we love seeing someone cry on National TV. Tara sang Keane's 'Somewhere Only We Know', playing the piano too. She got thrown by the poor playback in the studio and wavered a little, but when she finished, we started chanting her name. Then the judges began to quickly decimate her confidence and we started chanting in support - which overwhelmed her and she began to cry. Yes, we made an It-girl cry. How low did we feel? Er... not much really, because we're British and we're a fickle audience. Sports commentator Ray Stubbs gave up on singing and talked his way through 'Hit Me With Your Rhythm Stick', an act so brazen we of course loved it. I shouldn't have gone out. I'd been feeling ill all day and today I'm down with a (hopefuly only 24-hour) bug. But really, it was a lot of fun and my mate kept me laughing all night. You can hear him shouting all the way through the edition... yes, my flatmate recorded it. I have this theory that if you're travelling to work and look up every day at the same point to see which stop you're at, only to find you're still two stops away from your next interchange, then you're probably working too far away from home. It's not a theory I'm going to bother testing exhaustively, or submit to peer review, but most days when I get on the Jubilee Line at London Bridge, I tend to look up to see if I've reached my destination only to find myself at Westminster. I've no massive desire to work in Westminster, but it's a damn sight closer than working at the wrong end of the Central Line. It wouldn't be so bad if I didn't have quite so many changes either; whichever route I take it'll mean three trains or two trains and a bus. Lucky that, after a few years of increasing frustration and desperation over work, I'm now loving my job and the people I work with. And last Friday I learned that I'll be staying with this job until September. For various political reasons, it has to end there for the time being, but I'm hopeful that I'll be able to come back to it early next year (and I'll still be working for the same employer in the meantime, just on a different project). So, while I don't like having to get three trains there and the same amount back, while I'm there I'm enjoying myself, which is a bit of a result. Apparently, Jeanette Winterson has left her latest novel on a train. Well I mean, if she's not arsed about it enough to take it with her, that's a bad sign, isn't it? It's a novel way of trying out Book Crossing though, but I doubt it'll catch on. Had a fun Sign class today. Our tutor Terry is witty and always tries to illustrate his lessons with a few anecdotes, such as today's one, where he told us about driving from work on Monday, struggling to control his motorike against 60mph winds on the flyover, then getting home, driving his bike through the garage doors and being knocked off by the gate blowing shut and tipping him and the bike over. Six months ago, I wouldn't have got half of that. 'Motorbike' and 'wind' probably. We've been learning direction verbs - that's verbs that change slightly to indicate different things, such as showing action to or from someone [I ask you / you ask me], an action that's distributed in various directions [ask upstairs / ask everyone], or repetition [keep on asking - ask, ask, ask] - all using the same hand-sign but changing the direction or position of it. I need to practice more than I do, but it's good to have something to look forward to each week, and they're a nice bunch of people who all seem keen. I've signed up for the advanced course, so I hope I don't get out of my depth, but I seem to be coping okay so far. 18 March marks the fourth anniversary of the recognition of British Sign Language as a proper language with its own idioms and structure. Princess Diana did a lot of work to promote BSL, as its patron, but it took a long time for BSL to get any proper recognition. I've just found this video on YouTube. As with most vids, there's no guarantee it'll be up for long, but the gist of it is that this guy is encouraging everyone who can speak BSL to celebrate the anniversary of it's transition into a 'proper' language. I asked my pal Neil, who writes 'I Love London... Honest', why he learned to sign. One of his reasons was that more people should know how to, which works for me. We're both hearing, but Neil's very confident and articulate in signing, and he's been very encouraging to me. Six Degrees of Desmond Leslie. That's enough about me... tell me something about yourself. So - more downloading of music. Thanks to a certain honestly-legal source (yeah, really! ), I now have every single album by the Electric Light Orchestra. No, don't tut like that - they're the nearest thing to an officially-sanctioned Beatles tribute act who writes their own material. And thanks to Russell T Davies having his finger on the knob of the zeitgeist (or whatever), loads of people seem rather willing to admit that ELO were quite good actually. Thanks to someone I've been chatting to / up recently, I've also discovered Sigur Ros, which is doubly strange because I was chatting to my pal Sam today about having only just discovered them, and he asked me if I'd noticed he'd been wearing a Sigur Ros sweatshirt all week, which he'd been given by muso friends of is who'd played with the band. Sam does this a lot - becomes another degree of connection to whatever I'm obsessing about. Last year, I'd decided to try to collect as many of the stock music tracks used in early Doctor Who as I could. One piece of Musique concrete, which is just a pile of springs being played at different speeds, came from an album called Music of the Future' by Desmond Leslie. Now, as I began to read up on Desmond Leslie, I learned loads of fun facts about him, and proceeded to explain this to Sam one afternoon, just after he'd finished a quick phone call in the office. Apparently, the TV show The Sky at Night came out of a one-off show in which Patrick Moore and Desmond Leslie squared off in a debate about aliens and space. One of them got their own TV show, the other started writing for Fortean Times. DesLes next wrote the soundtrack for a film called First Man Into Space . which starred Roger Delgado - the man who later played the first Master in Doctor Who, and it's his soundtrack that provided that track used in the Doctor Who episode 'Edge of Destruction' and also pops up in 'The Moonbase' and a few other places, including an episode of Out of the Unknown called 'Counterfeit Man'. Phew! Isn't he just lovely? So polite and erudite. None of this Jerry Springer nonsense. Just decent, gentlemanly and - ooof! There ya go! All this was over a review Levin had written about an unfavourable play his then wife Agnes Bernelle had starred in. Agnes Bernelle later collaborated with, among others, Marc Almond (on his Stars We Are album). Camilla is his daughter from DesLes's second marriage. Such a spooky coincidence deserves a plug. Sam's website can be found at www.samsemple.com. He's a singer-songwriter and even though he's a mate, I genuinely rate his music. There are downloads for you to listen to yourself. So, of course he knew someone who'd played with the band I'd only heard of a week before. Cos he's Sam, and he's brilliant. And thanks to Sam, I'm only two degrees of separation from Desmond Leslie. DesLes's soundtrack to that film, by the way, is hideous if you don't like Musique Concrete. Really unlistenable. But dig those springs!